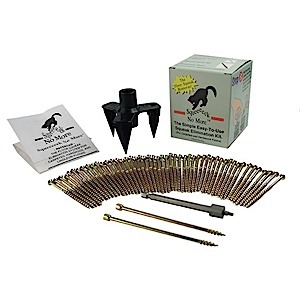 O'BERRY ENTERPRISES 3233 "SQUEEEEEK NO MORE" FLOOR REPAIR KIT (SKU 765806032333) as seen on Ask This Old House is an excellent squeaky floors under carpet repair kit to eliminate floor squeaks, especially when there is no access to the floor joists. This squeaky floor repair kit is used directly through carpeting. Really! I'll admit I was skeptical at first. Always before when I put a screw through carpeting, the screw would grab the nap of the carpet and wrap itself up. This time to be safe, I tested the Squeeeeek No More on a closet floor. Only when I felt comfortable with it did I tackle a couple of squeaky areas in the hallway. The Squeeeeek No More kit contains a plastic molded alignment and depth control fixture (replaced the zinc fixture), 50 specially scored 3-inch x 1/8-inch diameter screws, a customized driver bit to regulate the depth at which to drive the screw, and two joist-finding screws to help find the joist from above. I have not tested the joist-finding screw that's part of the kit, but basically the joist-finding screw has only four threads at the end of the screw. If, after installing the screw through the carpet, underlayment, and subfloor it hits dead space, the screw will spin, but can be backed out with the aid of power screwgun and a pair of pliers. If it hits something solid, like a floor joist, it will back out the same as any other fastener. Squeeeeek No More works so well because the 3/16-inch coarse thread of the special screw prevents it from being wrapped in carpet nap and the score on the neck of the screw allows it to snap off below the surface of the floor. Take a few minutes to read what our satisfied customers have to say by clicking here to read their feedback. If you've got squeaks under your carpeted floors, Squeeeeek No More is for you! All you need is a power screwgun and the courage to put that first screw through the carpet. Locate the floor joist, using the technique outlined in the complete instructions included with every kit. Then, push the alignment and depth control fixture firmly into the carpet. Place your weight around the fixture, and drive the screw down as far as the fixture will allow it to go. Place the screw gripper on the alignment fixture over the screw head, then rock the fixture from left to right, snapping off 1-inch of the screw's shank. The screw breaks at the weak spot that is consistently just below the surface of the floor. Before using this kit, I recommend that you print this page for reference. The flooring kit was designed to get the job done—we encourage you to read everything carefully before using the kit. It's important that you understand your floor construction and isolate the squeaks. The kit has a proven track record and works as designed. These tips go beyond the instructions included with the kit. The biggest mistake most individuals make is that they get in a hurry to use the kit. Those who used the kit successfully are those who took their time and did their homework. Where do squeaks come from? An estimated 85 percent of all squeaks come from the top of the floor joist and the underside of the subfloor. In most cases there's no glue between the joist and the subfloor and nails were used rather than screws. If nails were used, they most likely were not ringshank nails. Over time, regular nails will pop upward, causing the bottom side of the subfloor to rub on the top surface of the floor joist and on the shank of the nail and a squeak is born! Squeaks can come from around floor ductwork. Squeaks can be created if one (or more) of the floor joists crowns downward rather than upward. Squeaks can be found in the field, i.e., the areas between joists. Squeaks could also come from between the subfloor and the underlayment or at the joints where they meet in double-floor construction. In single-floor construction, the squeaks could come from where the subfloor's joints meet or between hardwood and the subfloor. Normally in single-floor construction T&G sheet goods are used—squeaks could also come from the T&G joints. Subfloors could be constructed using plywood sheets or 1x materials fastened on an angle to the tops of the floor joists. Normally 1x materials have spaces up to 1-inch between them, so if you are using the kit, it's possible that you could install a screw into one of these open areas. Because the fastener has nothing to grab on to, it will not work properly. This is one situation where it's really important to understand your floor's construction. Where should you start? First spend time to isolate the squeaks. Once they are located and marked with painters' blue masking tape, locate your joists and the direction they run. Next check to see if the squeaks you marked are in the same area as the floor joists (most likely they are). Now you are ready to use the kit. Begin by installing the screws directly over and into the floor joists. It is better to spread your screws apart, and the spread will be determined by the squeaks you located. If after doing this there are still squeaks, then begin again to isolate the squeaks. It's possible they are now within the field (between floor joists). Don't get carried away and install screws all over the place. Just because the kit contains 50 screws doesn't mean that you should use them all in a concentrated area. Isolate the squeaks and determine the width of the squeak area. Then use as few screws as possible to stop the squeaks. Know the direction the floor joists run and where they are located in relation to the squeaks. This product has a great 18 years+ track record and is successfully used by DIYers and professionals alike. Customers who have called to tell us they were unable to get the kit to work or that the kit didn't work hadn't carefully read the Troubleshoot Before Using The Squeeeeek No More Kit (above) or the Troubleshooting (below), didn't understand their floor's construction and/or how squeaks travel, or didn't know how to properly use a cordless drill. In most cases when a screw goes only partway into the floor, it's due to incorrect tool use. If you are using a cordless drill/driver and cannot install the screw into the floor all the way, most likely the tool is not set up properly for use with this kit. Other possible causes could be that the cordless drill/driver doesn't have enough volts (power) or its battery is not fully charged. A 12-volt cordless drill/driver (or larger) is recommended for use with this kit. A cordless drill is really a drill/driver, which means it was designed for use as a drill when set up in the drill mode. When used as a driver, it is designed to put in screws safely so as not to break off the head of the screw if the torque setting is correctly set. Unfortunately, the torque setting will not help with this kit when it comes to setting a screw to the full depth of the screw (3 inches) or for snapping the screw at the score mark. To set the torque setting, locate the plastic multiple torque setting ring at the base of the drill/driver just before the base of the chuck. It has icons of screws or numbers and an icon of a drill bit. Set the drill/driver so the indicator points to the drill bit icon. The driver mode has a clutch system designed to safely install screws without stripping or breaking off heads.The clutch prevents the tool from drilling, from installing 3-inch screws, and from snapping the screws as designed. Therefore, you want to set the cordless drill/driver to the drill mode to turn off the driver mode and inactivate the clutch. This setting will give you the full torque of the tool (i.e., no clutch) required to install this kit. HERE'S THE BOTTOM LINE: Put the cordless drill/driver in the drill mode when using this kit. The main reason why a screw spins and will not snap or back out is because the screw's threads are in a void (space) in the subfloor or are not in contact with a solid framing member such as a floor joist. To remove the screw when it spins, grab the shank of the screw with a pair of pliers and pull up at the same time as you back out the screw. Another reason why a screw spins is because the screw may have broken below the intentional score mark where the screw is suppose to break. It is the upper portion of the screw that will be spinning. Again, grab the shank of the screw with a pair of pliers and pull up at the same time as the screw is being backed out. If a screw breaks prematurely, it is possible that the screw tip hit another fastener (nail, screws, or staple) in the subfloor or a knot in the subfloor or framing member (joist). Unfortunately, this can happen and it's not the fault of the product. To get the screw out place a locking piers on the remaining portion of the screw and turning the screw counter-clockwise to back the screw out. Two joist-finding screws to help find the joist from above.